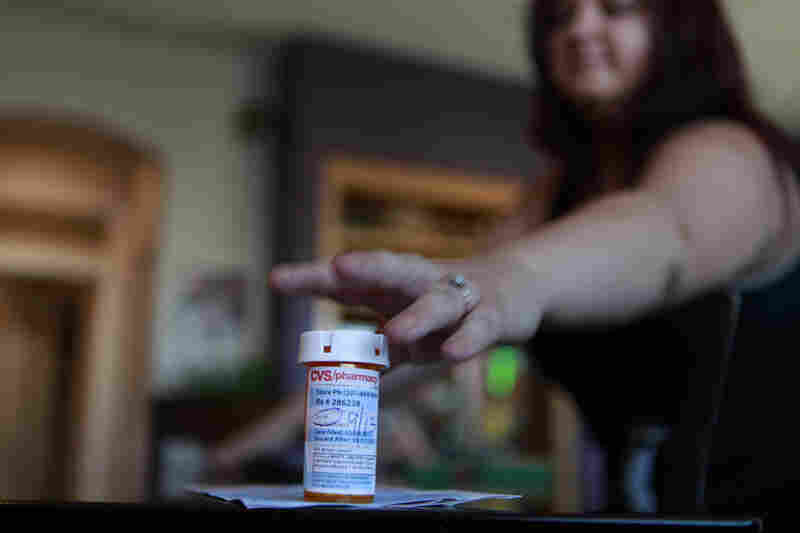 Health Insurance Cutbacks Squeeze The Insured : Shots - Health News Health insurance has been changing dramatically. Even people with insurance are paying thousands of dollars out of pocket before their insurance kicks in. And when that happens, insurance picks up less than it used to — often a lot less. 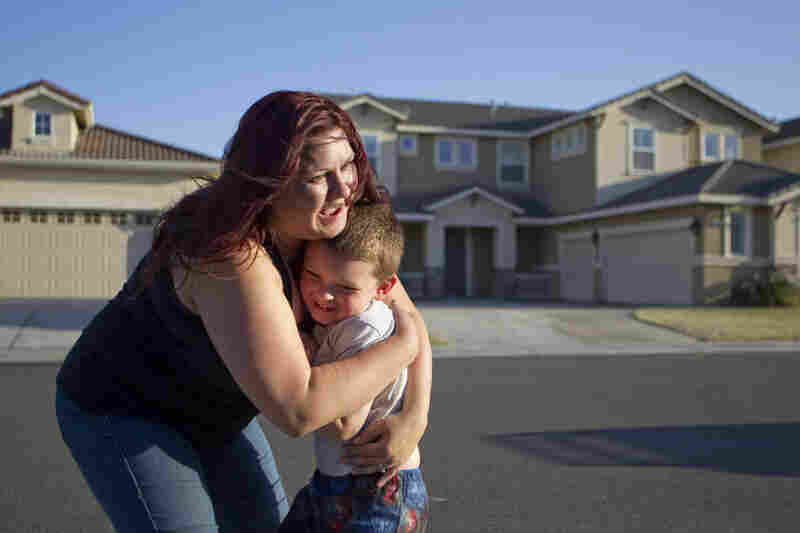 Amber Cooper lives in Modesto, Calif., with her son, Jaden, 5, and her husband, Kevin. She had a liver transplant when she was 10 years old and needs daily medication so her body won't reject her liver. When Amber's employer changed health care plans, she could no longer afford the blood tests that monitor her liver. She also had trouble paying for her medication. A charity, Healthwell Foundation, stepped up to help pay her health care costs. Jaden climbs into a kitchen cabinet, removing the food from the shelves so he can fit. Amber says she can't afford to buy him new shoes or clothes because of her health care expenses. 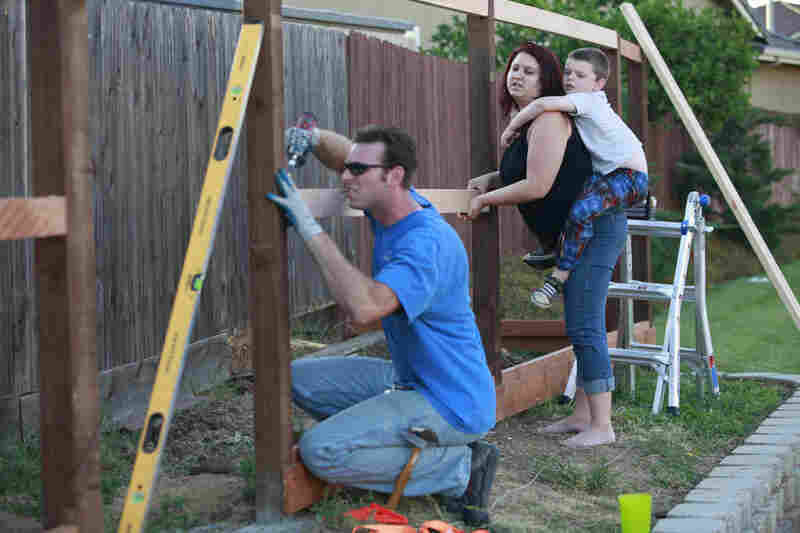 After coming home from his job, Kevin works on a fence he is building around their home. The Coopers have stopped taking trips, eating out and spending money on anything else they don't need. Amber waits for her monthly blood test at a lab in Modesto. For several months she couldn't afford the tests, but then her company changed insurance again and she was able to resume them. The family tries to find entertainment at home — like letting Jaden play in the sprinklers and walking to a neighborhood park — to save money. Amber Cooper and her husband were doing OK. They had jobs, a healthy 5-year-old son, a house in Riverbank, Calif., and health insurance from her job in the accounting department of a small manufacturing company. "We were in a conference room ... and I had heard rumors but didn't know if it was true, and I started crying in front of everyone and actually had to excuse myself to gather myself together and go back in. It was devastating for me," Cooper said. Devastating because the rumors — her worst fears — had come true. She was in that conference room for a meeting about her health insurance. Cooper had a liver transplant when she was 10. She takes a drug twice a day so her body won't reject her liver. "Every year my company changes the insurance. And instead of giving us three different choices for insurance plans, they were changing to one, which was a high-deductible plan with no prescription coverage," she said. Cooper was stunned. Her anti-rejection medicine costs way more than she could afford on her own — more than $1,000 a month. Cooper, 30, started a frantic search for help. Finally, she found the HealthWell Foundation, which was willing to pay for her medication. But she still couldn't afford the $300 blood test she needs every month to make sure she's not rejecting her liver. "It is scary because the only way to tell if you're going to go into rejection is by the blood work. Your numbers will be a little bit crazy, and then the doctors will be like, 'OK, you need to get in and we need to check you out and make sure you're OK.' So I really took a risk not getting that blood work done. But I couldn't afford to get it done. I really couldn't," she said. What happened to Cooper is happening more and more these days. Health insurance has been changing dramatically "beneath the surface," said Drew Altman, president and CEO of the Kaiser Family Foundation, a private, nonprofit, nonpartisan research group. "In plain language, it's becoming skimpier and skimpier and less and less comprehensive." Paul Fronstin of the Employee Benefit Research Institute says that is the trend nationally. "Deductibles have gone up. Copays have gone up. You see cost-sharing for out-of-network services have gone up," Fronstin said. "It seems to have accelerated in the last few years. Health care is just continuing to take a bigger bite out of take-home pay." So even people with insurance are paying thousands of dollars out of pocket before their insurance kicks in. And even when it does, insurance picks up less than it used to — often a lot less. 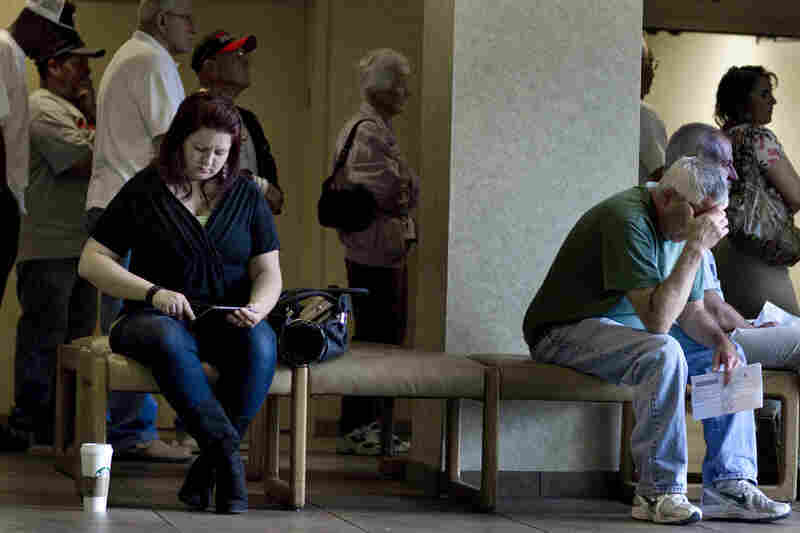 More than 1 in 5 Americans had a problem getting insurance to pay for a hospital, doctor or other health care in the past year, according to a new poll by NPR, the Robert Wood Johnson Foundation and the Harvard School of Public Health. Altman says this comes as many families are struggling to get by. "This affects not only how people seek health care — they're more reluctant to get it if they can put it off. But it also affects family budgets in a very real way, especially as we're still coming out of recession and families are still crunched by a weak economy," Altman said. Cooper's family has stopped taking trips, eating out, fixing up their house or spending money on anything else they don't have to. Their son gets by with hand-me-downs, she said. "He's 5 and growing out of everything. I haven't been able to buy him any clothes and shoes. Those are things I haven't been able to purchase because of the increase in the health care," she said. And Fronstin says the weak economy is driving more and more companies to cut back on coverage because of simple math: It's the only way they can keep up with rising health care costs. "Employers are trying to manage those costs. They're trying to keep those cost increases as close to inflation as possible. And they're doing everything they can to get their workers so that they think twice about the health care that they are using," Fronstin said. Cooper is just grateful she's getting her drugs every month. And she started those monthly blood tests again when her company changed insurance again this year. But it's still not as good as it used to be. So she and her husband don't go to the doctor when they get sick if they can avoid it. The same goes for their son. "There were a couple of times where he got sick where I just tried to do the best I could with what I had, whether it was children's ibuprofen or cooling him down with cool rags and that sort of thing," she said. She can't help but worry about the next company meeting about her family's health plan. "It changes every year, so I really have no clue what's going to happen next year and with them making that change, I really don't know what to expect every year," she said.